“Smile a bit, you are not in Athens”, Stéphane tells me while preparing to take a photo of me in the hall, where 300 Yellow Vests’ representatives from all over France, divided in “sub-groups”, are examining the various questions their movement has to address. 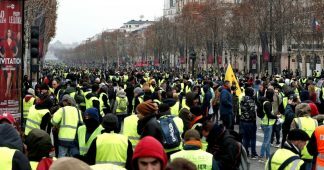 They are the delegates (or “observers” in some cases) send here from one hundred Citizens’ Assemblies, created by the Yellow Vests from Lorraine to the Atlantic and from Lille to Toulouse, to participate in the first attempt of national coordination and “federation”, by an “Assembly of the Assemblies”, of the Yellow Vests movement which, 12 weeks since it begun, continues to scare to death not only Paris authorities bur all European capitals and the EU unelected authorities in Brussels. A few minutes later, when she takes the floor to report about developments in her region, she steals the show. Her speech is straight, clear and determined like a sharp knife, and she gets a big applause. 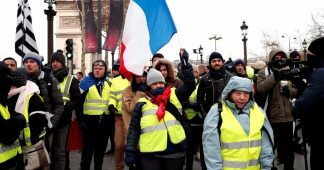 A large number of women, from the French popular classes are at the forefront of the Yellow Vests’ movement. And as we know from the history of revolts, women are often more determined than men in such situations. 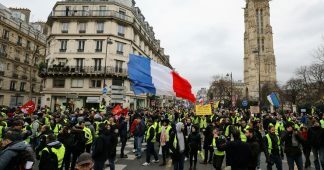 “We really believed we are living a new August 10th, 1792”, told the Journal de Dimanche a close associate of President Macron. 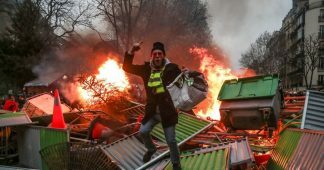 (On August 10th, 1792, the storming of the Tuileries Palace by the National Guard of the Paris Commune and fédérés from Marseille and Brittany caused the fall of the French monarchy. King Louis XVI and the royal family took shelter with the suspended Legislative Assembly). 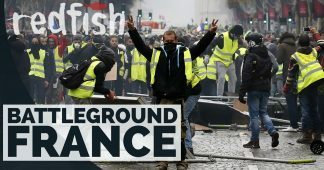 Battleground France: Who is Behind The Yellow Vests?